WARNING: This is a preview of Brink. I was sent a prototype version of the game. All components and rules are prototype and subject to change. When you open the game up, you will see the box separates and the rules are on the backside. 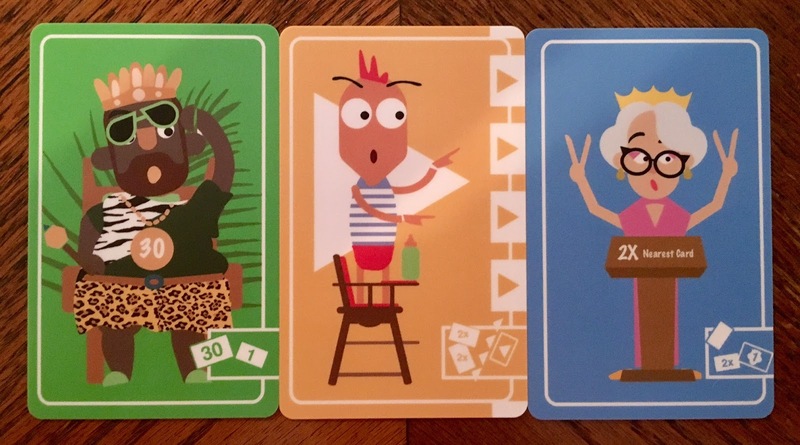 They are very simple, and you really won't need but 1-2 minutes to read them and understand the game. For setup, you will find a table and place the scoring line about 1-2 feet from the edge of the table. You will then take turns tossing the 11 cards from the other end of the table, trying to score points. 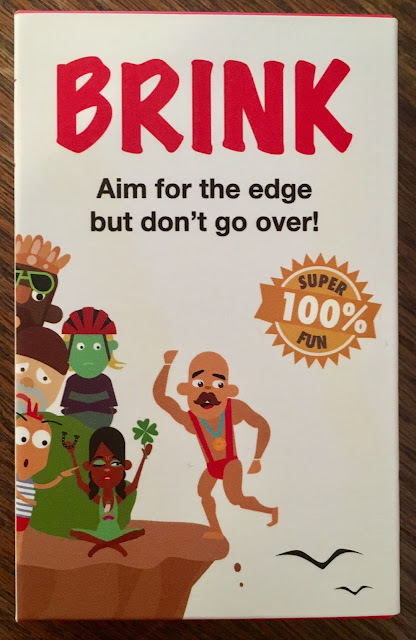 You score 10 points if the card is on the brink of the edge. The card qualifies for being on the brink if there is any part of the card hanging off the edge. 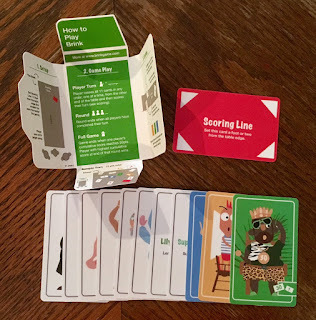 You will score 1 point if the card is within the scoring line. 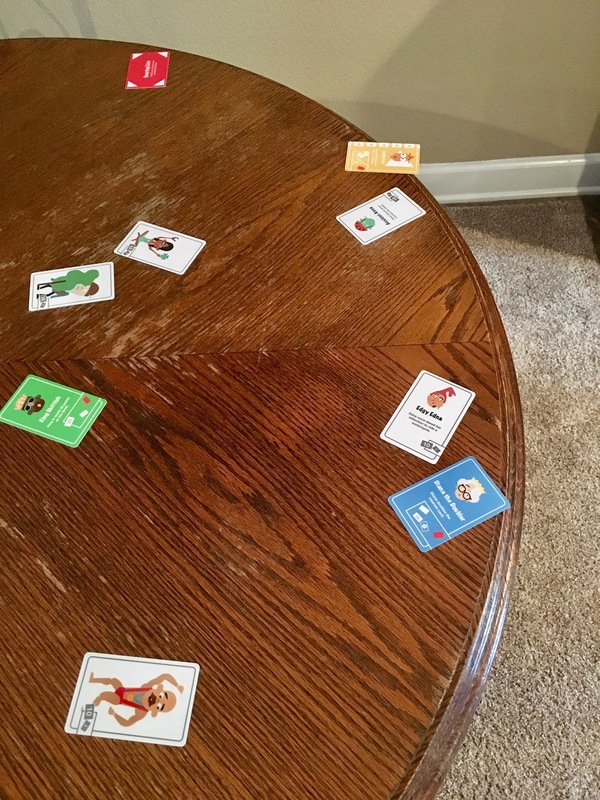 No points for cards that have fallen off the table. Special cards help you score better points. 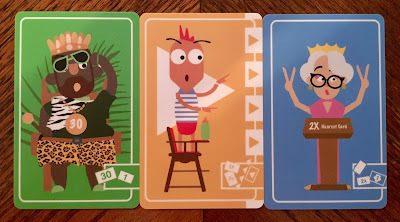 King Skittish gives you 30 points if on the brink, Diana the Doubler will double the nearest card, and Looks Lou doubles all cards leading in the direction pointed on the card. Really there is no theme in the game. On the box it does read " ...There was once a land where no one took risks. Every day they chose the easy way and slowly but surely their land shrunk smaller and smaller and smaller... Until one day King found a cliff out his front door. Terrified, he dared his bravest to explore the dangerous edge and discover new land. But alas these were the bravest he could find..." This game is a dexterity game where you toss cards to get them on the brink of the edge. The components consists of 12 plastic cards. They are thick plastic, about the thickness of a credit card. They slide very well on the table and do their job. They are made to last due to sliding them across the table. The box is also made out of plastic, just not as thick as the cards. The art isn't anything amazing, but works well with what the game is. This isn't a detailed, heavy game you would sit down for hours to play. This game is a light, easy, simple, fun game to play, maybe even while waiting for people to arrive to game night. The game is actually entertaining and fun. 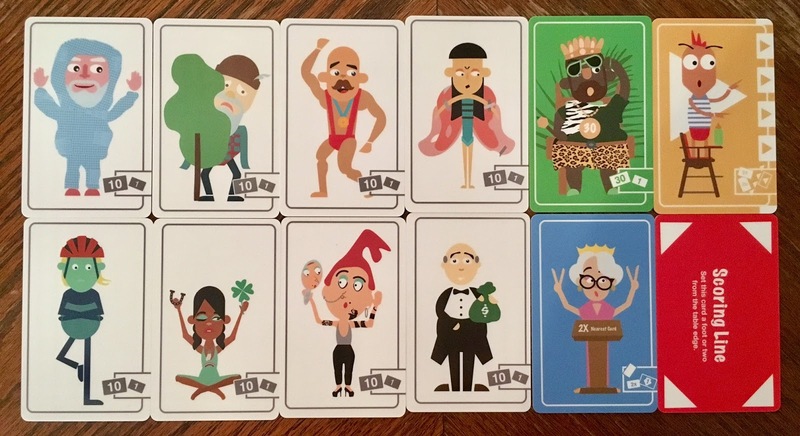 You might think you could just get 12 library cards and play the exact same game, and I would say, correct, you can. This game seems to bring those that don't want to play games to come and watch you and other playing games. It's not as easy as you may think, as you hit already thrown cards off the table, or maybe get lucky and hit them to the brink of the table. The flavor text on the cards are fun for the game. The rules aren't detailed for some events that can happen such as hitting the scoring line card. Do you reset the line? Do you say, wherever it lands is the new line? 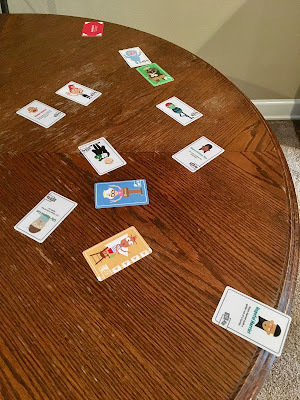 The game is super simple, and as stated above, you can get some library cards and really play the same game. When playing 2 player, we felt like it would be better with having another scoring line to toss the cards from one end to the other. This is a fast fun game you can play while waiting for people to show up to game night. This also is a fun game to introduce to others who don't play games. The game is what it is, and there are no hidden secrets. I would recommend this game to gamers who like dexterity games. This game would be good for introducing others to games or if you are always waiting for people to show up for game night. On KICKSTARTER between now and October 6, 2017.